Living in a tourist-dependent economy, businesses in the Sierra Nevada are uniquely afflicted by climate change impacts. If we have no snow, that creates consequences that ripple through our economy. Shorter ski season and longer fire seasons means that hotels, resorts, restaurants and shops are less busy. Businesses here adjust by reducing seasonal workers, which adds strain on families. Sluggish sales mean less tax revenue for basic public services. Small businesses face a particular set of challenges. When you¹re meeting a payroll with local workers, you don’t have the luxury to defer losses to the next quarter like a larger employer might do. Especially in our region, small businesses have to play a role in protecting and defending the environment we depend on for our livelihood. By conservative estimates, last year’s Rim Fire triggered as much as $1.8 billion in economic losses. South Lake Tahoe hotels faced an occupancy decline as high as 20 percent just due to smoke. After decades of predictable seasons, climate change is now making it impossible for local businesses to plan inventory and sales cycles. At Tahoe Mountain Sports, we need to sell hiking apparel while still paying winter bills for skis that never sold. As a result, we are not hiring as many seasonal workers, and this sometimes means people in our community have to find multiple jobs or go elsewhere. In much of rural California, most private sector employees work for small businesses. Of the 4,000 network members that belong to the Sierra Business Council, 80 percent are small businesses. These businesses consist of people who have a deeply embedded history here and who enable us to do really great things in small towns. It would be a shame for them to become another economic casualty of climate change. In the future, the economic landscape could shift in favor of businesses that don’t reflect the region’s values. State lawmakers are now considering two key bills that would benefit our region. SB 32 extends and builds on the proud legacy of California’s landmark climate change law, adopted in 2006. SB 350 puts us on a path to achieve three goals by 2030: a 50 percent reduction in petroleum use from vehicles, 50 percent of electricity generated from renewable sources, and a doubling of the energy efficiency of our buildings. While we know meeting these forward-thinking goals won’t be easy, the alternative is costly for so many here. The two bills build on California’s signature clean energy and climate law, AB 32, which is already achieving its twin objectives: reducing emissions and investing in communities. Our Assemblymember, Brian Dahle, has welcomed local investments from AB 32. In total, the state has invested more than $12 million in his district this year alone. Proceeds from AB 32 have funded projects in urban forestry, sustainable housing and transportation, and restoration of meadows and wetlands. The district has also benefitted from more than $137 million in public and private clean energy investments, sustaining over 6,600 jobs. For a rural community like ours, these dollars are a big deal. The Sierra Nevada is a place of incredible opportunity and beautynot to mention the source of 60 percent of California’s developed water supply. If we act now, we can protect this sacred place that is such a significant part of California’s identity. This opinion column was provided to the Sun by Resource Media, a San Francisco-based public relations firm, on behalf of the authors. Steve Frisch is president and a founding member of Sierra Business Council, with locations in Truckee and Sonora. Email him at sfrisch@sierrabusiness.org. 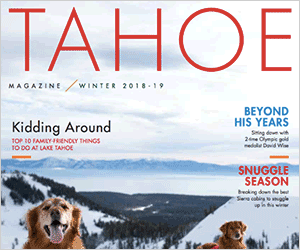 Dave Polivy and his wife, Pam Jahnke, own and operate Tahoe Mountain Sports, a specialty outdoor gear retailer in Truckee. Email him at dave@tahoemountainsports.com.